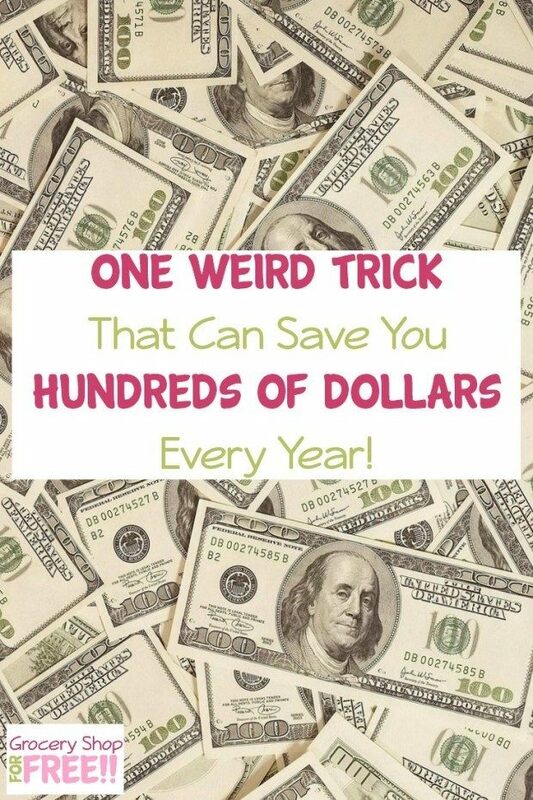 Save Hundreds Yearly With This One Trick! You are here: Home / Finance / Saving Money / Save Hundreds Yearly With This One Trick! This is a guest post written especially for Grocery Shop For FREE readers by Elise New. One Weird Trick That Can Save You Hundreds Of Dollars A Year! I know, I know, the internet is full of money-saving ideas. 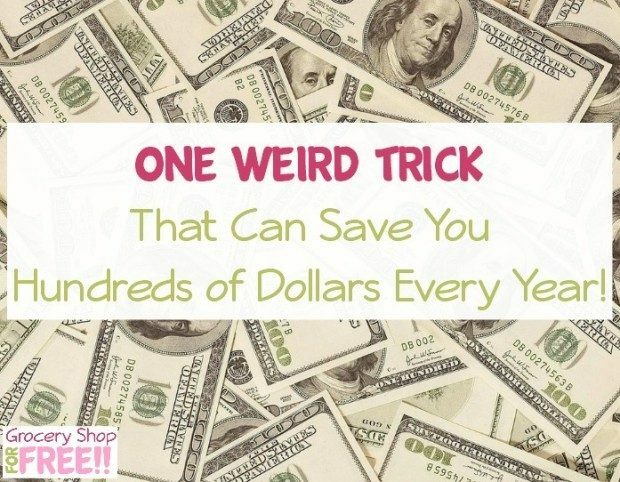 But let’s face it – that’s because the ways in which you can save money are almost literally endless! Still there has to be one trick to rule them all, doesn’t there? That’s it! Use a note-taking app on your phone or computer, or if you like doing things the old fashioned way, use a pen and paper notebook. And here’s the trick: always keep it with you! It doesn’t do you any good if you can’t see it! So how does writing everything down save you so much money? I’m glad you asked! If you have to write down and be accountable for everything you buy, you’re a lot less likely to buy things you don’t need! This sort of accountability works especially well if you share your list, and even have list meetings, with your significant other. If you don’t have one, asking a friend to be your accountability partner works wonderfully too! I would guess that this saves me an average of $5-10 every time I go to town. I’m not buying doughnuts, or stopping at a fast food joint if I have to tell my husband about it! Tip: Take a snapshot of your receipt with EverNote for easy saving and sharing. Keeping a running grocery list at your fingertips is invaluable for finding the best prices any time you happen to be in a store, and prevents your passing up a sale because you didn’t remember that you needed an item. Tip: Check out our FREE Price Book Sheets to help you keep track of the best prices. By writing down the prices you’ve paid for items, and where you bought them, you create an amazing savings tool! Now you can compare prices everywhere you go, and never pay more than the rock bottom. Especially when you start using this list to recognize an amazing stock-up quality sale! You’ll also be able to tell which type of item is cheaper. For instance, Buying frozen produce is typically a fraction of the cost of fresh produce (I estimate that we save an average of $5 per week just by buying frozen broccoli – that’s $260 a year! ), and dry beans are a significant savings over canned beans. I like to use spreadsheets for this part of my list making, and Google docs is a super handy way to access them either via computer, or with on my phone (with the Google Docs app). It’s nice to know at a glance that frozen broccoli is cheaper at H-E-B than Walmart, and that Butter is cheaper at Aldi than H-E-B. If you’re going out, having a list of all your stops handy enables you to plan ahead for the most efficient route possible so that you save both time and money by driving fewer miles. Likewise, having a list in hand when you walk into a store allows you to get in, get the things you need, and get out without wandering around unsure of where you’re going, and of course, picking up things you didn’t really need. It lets you see your mistakes, and fix them. You might be buying things that cost you more than you realize. I know I was! It’s easy to think that something isn’t costing you much until you start looking at all those shopping lists and receipts. For me, the straw that broke the camel’s back was tortilla chips. They’re just a couple bucks per bag, but after looking at my receipts, I realized that $8 a month was $96 a year. I could have gotten a hotel room for that overnight get away with my husband that I wanted so badly. But instead, I’d spent it all on tortilla chips. Not. Cool. That’s kind of where the whole list-making thing started for me. Because now that I have lists, I can see the mistakes before they get big. Writing things down isn’t rocket science. We’re not clipping, matching, or stacking anything. it’s simply taking a few seconds to snap a picture of a receipt, or make a note on your smartphone. Saving money doesn’t get much simpler! Your turn: How do you use lists? Share your tips and experiences in the comments!